It’s time for the annual N.C. Cooperative Extension of Lincoln County plant sale again!! 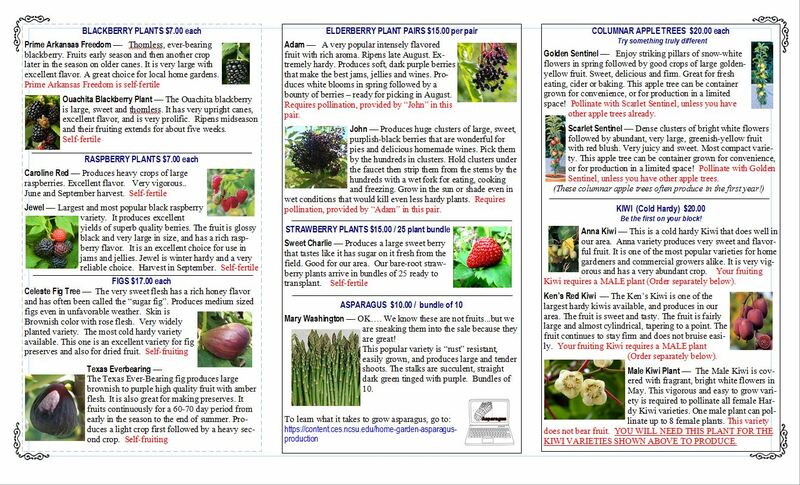 We are offering BLACKBERRY, BLUEBERRY, RASPBERRY, ELDERBERRY, FIGS, APPLE, STRAWBERRY, and even ASPARAGUS plants. All arrive in early March, ready to plant. Don’t miss out on the fun! All the plants are selected for success in our area and arrive ready to go in the ground. We even provide the info you need to have success with your plants, even if this is your first time out. The hardy kiwis are delicious and quite productive right here in our area too! They lack the “fuzzy” covering that we are used to in kiwi, but not the tastiness. If you like kiwi, try some of these plants and enjoy growing your own vine-ripened fruits. 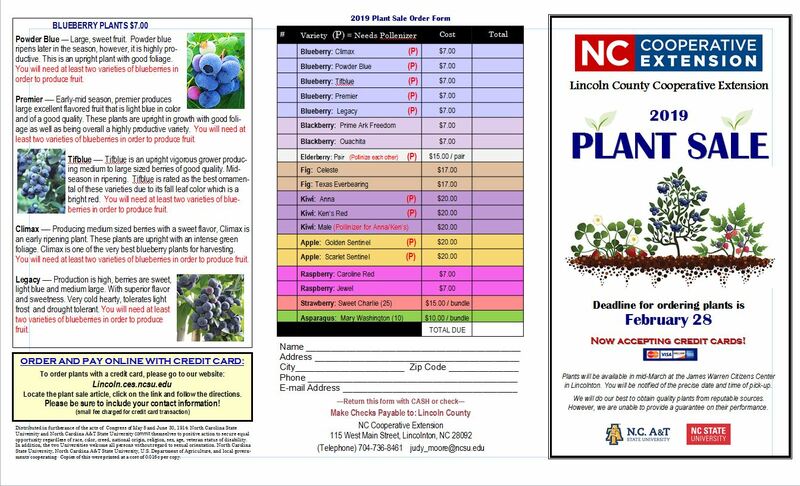 Plant sale proceeds go toward N.C. Cooperative Extension of Lincoln County educational efforts, which range from Agriculture and Food Science to youth development and 4-H in Lincoln County. Please call us at 704-736-8461 for a sales brochure, or in person at our office (115 W. Main St. Lincolnton, NC) for more information. For the first time, you can even order and pay online, through NC State University. We look forward to hearing from you! Order online with a credit card. • Backyard Berries: Berry Fun!